We believe the school uniform is very important in making children feel part of the school. 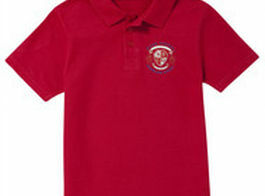 The uniform is practical, enhances the tone and atmosphere, and helps maintain pupil pride in the school. Much of the uniform is available on line from Tescos. Hair fastenings should be plain and functional, not decorative or fashion statements. A pair of plimsolls for wear in school. We are fully carpeted and this ensures that we can maintain the school to a high standard. All uniform can be purchased from the Tesco website. This includes sweatshirts, cardigans and red polo shirts with the school logo. Jewellery should be kept to a minimum for health and safety reasons, and for security. Watches and medical bracelets only are allowed. Pierced ears should have small studs only – no other piercings are permitted e.g. nose etc. Please avoid extreme hairstyles, including dyed hair. Hair shoulder length or longer should be tied back. Fringes should be clipped back out of eyes.